It is often only after accidents have occurred that particular junctions or stretches of road are identified as problematic for drivers, cyclists or pedestrians. 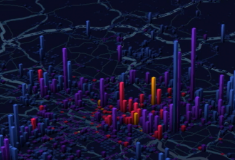 But now Ford has come up with a means by which big data could potentially help cities identify locations which, if nothing is done, are most likely to be the scene of future traffic incidents. To help find the answer, Ford Smart Mobility, spent the last year recording 1 million kilometres of vehicle and driver behaviour in and around London. The company tracked vehicle journeys in the city and logged highly detailed driving data from driving events such as braking, the severity of that braking, and even where hazard warning lights were applied. This helped to identify “near-misses”. Ford then cross-referenced this information against existing accident reports and built an algorithm to determine the likelihood of where future incidents might occur.